Car hire in Thailand. 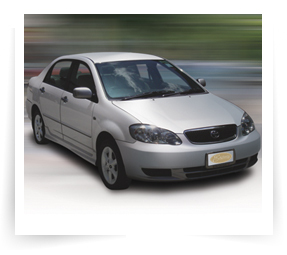 Car rental rates for Bangkok, Chaing Mai, Pattaya, Phuket, Khon Kaen, Chiang Mai. Loss Damage Waiver (LDW) at Baht 200 per day. An excess charge of Baht 10,000 will apply in the event of non-recoverable loss or damage. One way rental fee for 3 consecutive day hires or more. Baby safety seats at Baht 100 per day. Chauffeur driven rate at Baht 600 per day. Gasoline used (vehicles are supplied with a full tank). Excess kilometer for LMAR class is 5 Baht per kilometer. Delivery or pickup fee 400 Baht will apply after service hours. Minimum driver age is 21 years. 24 hours is one rental day. Extra full hours are charged at 1/4 of the daily rate. An excess charge of Baht 5,000 will apply in the event of non recoverable loss or damage. Customers must have a valid credit card, driving license and a copy of identification card or passport. Copyright © ThaiCarhire.com All rights reserved.